If you have a WordPress blog, one of the more important things you can do is focus on the performance of that site. Ok, maybe that should be the second thing behind writing killer content. 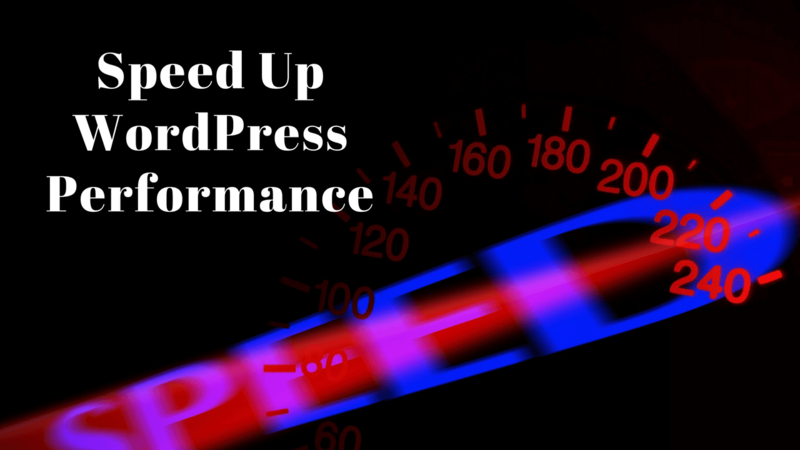 In any case, WordPress performance optimization should rank right up there on your priority list. If your site takes forever to load, do you really think a visitor to your site is going to stick around and wait. Nope! They’ll hit that back button quicker than you can say – wait! And then there’s Google. Google loves performance, and will reward you (or not penalize you), if you have a site that loads quickly. That’s why I created this post on WordPress Performance Optimization Tips, and I have a video to go along with it (with a link below). So how do you get the WordPress performance that you’d like to get? Simple, there’s a plugin for that. In our case, we’ll focus on two specific WordPress plugins to help optimize the performance of our WordPress site. By using both of these plugins you’ll see a drastic improvement in your WordPress performance. EWWW Image Optimizer will compress the images on your site. This nifty little tool will automatically compress any new image that you upload to WordPress, and it will do this for your in the background. So if you are uploading a new image to include in a blog post, EWWW Image Optimizer compresses it and maintains the quality. What if you have a number of images already uploaded? This plugin can take care of that for you as well. There’s a batch process you can run directly from the plugin. This process will search all images, and compress each and every one of them for you. I’ve used this plugin for years, and I’ve never been tempted to try anything else. It’s that good. W3 Total Cache is a multi purpose plugin that can do a number of things to optimize the performance of your WordPress blog. This thing can get a little technical, and there are a number of options to configure. But it’s well worth spending the time learning it, as the performance boosts are tremendous. I know what you’re thinking, give me something more to go on than just listing a couple of plugins. Well, it’s much easier laying this all out in a video, and that’s exactly what I did. Take a look, and you’ll see how you can configure both of these plugins to give you the WordPress performance optimization you so desire. Not only that, I’ll prove it to you in the video. We’ll take a before and after snapshot of our WordPress performance using two different tools (Pingdom and GTMetrix). You’ll see first hand how these performance optimization tips will improve your blog. Here’s a link to my video on WordPress Performance Optimization Tips if you’d like to view it on YouTube. And if you find value in this, please be sure to subscribe to my channel, as I’ll be posting other videos in the near future. Very useful tips here. Two plugins promise to provide a huge gain in performance. We stand to benefit a lot from your experience. If we had to find out these ways on our own, it would have taken a lot of time. You have rightly said that poor performance has a double impact i.e. the visitor gets upset and google rankings may suffer. You have chosen plugins that bring the greatest gains. Images are perhaps the number one reason a site becomes slow to load. Now, when we want to do something about performance, we know where to begin for fastest results. Thanks for sharing these great tips with us. Have a great day! I would say that i have learned a lot on WordPress optimization with W3 Total cache tips.